As more companies incorporate robotics into their operations, the demand for high paying careers related to designing, implementing and using industrial robots is increasing. 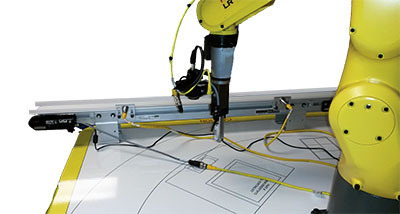 FANUC's Certified Education Robot Training program certifies instructors at high schools, trade schools, community colleges and universities to train their students to program FANUC robots through on-line and hands-on training courses. 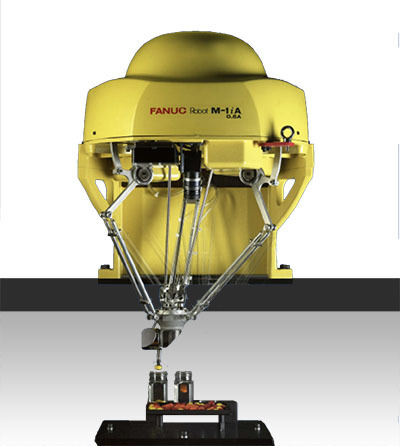 FANUC CERT programs integrate well with: Industrial, Mechanical, Digital and Lean Manufacturing, Engineering, Computer Numerical Control, Inspection and Quality Control, Operations Management, CAD, and Computer Integrated Manufacturing programs. 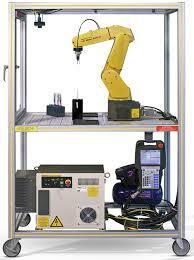 FANUC CERT carts are compact, portable, self-contained educational robotic labs. The CERT educational mobile labs include standard industry robots, color graphic iPendant, collision guard, dual-check safety, and wide rand of software and hardware features. All Carts include: iRVision, Gripper, Tooling, 120VAC Transformer, Compressor, CERT training program. 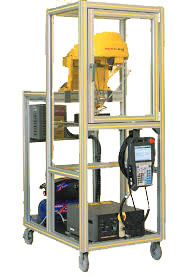 This FANUC Robotics Education Training Cart incorporates the compact LR Mate 200iD Robot housed in a self contained, mobile enclosure. The lightweight LR Mate Robot is designed for small part handling, high-speed picking and assembly applications. Take the training where you need it: the classroom, the laboratory or even a remote site. Use the FANUC CERT cart to teach how to program a real robot, in real time, in a safe and controlled environment. This FANUC Robotics Education Training Cart incorporates the compact M1iA Robot housed in a self contained, mobile enclosure. The lightweight, parallel-link M1iA Robot is designed for small part handling, high-speed picking and assembly applications. Take the training where you need it: the classroom, the laboratory or even a remote site. Use the FANUC CERT cart to teach how to program a real robot, in real time, in a safe and controlled environment. The NEW FANUC LR Mate 200iD/4S FENCELESS CERT Cart was developed from combining FANUC DCS Position and Speed Check software with an Allen Bradley SafeZone Mini Safety Laser Scanner. The result is FANUC’s NEW FENCELESS Cart, which still fits through a standard door and runs off 110V power. The FENCELESS cart allows a greater work envelope and introduces students to the latest in integrated safety products from FANUC and Allen Bradley. The NEW FANUC FENCELESS CR-7iA CERT Cart was developed from combining FANUC DCS Position and Speed Check software with an Allen Bradley SafeZone Mini Safety Laser Scanner. The result is FANUC’s NEW FENCELESS CERT Cart, which still fits through a standard door and runs off 110V power. The FENCELESS cart allows a greater work envelope and introduces students to the latest in integrated safety products from FANUC and Allen Bradley. 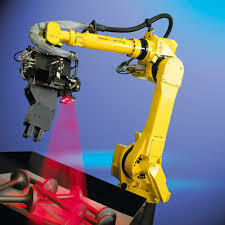 Enhance your CERT cart with FANUC Robotics iRVision. The first on-board robotic vision system, making all R-30iA robots “Vision Ready.” Simply connect a camera, and you’re ready to take advantage of the power of integrated vision. Connect any PC with Microsoft Internet Explorer™ directly to the robot controller to set up, calibrate and train your application. Use the built-in vision commands to teach your robot – true seamless integration. FANUC's Integrated CERT Conveyor System provides students with the opportunity to work with the iDrive Conveyor with V-Belt Tracking and retro-reflective proximity sensors. Students learn inbound and outbound controls, through hands-on learning techniques, on the same conveyor equipment used in industry. 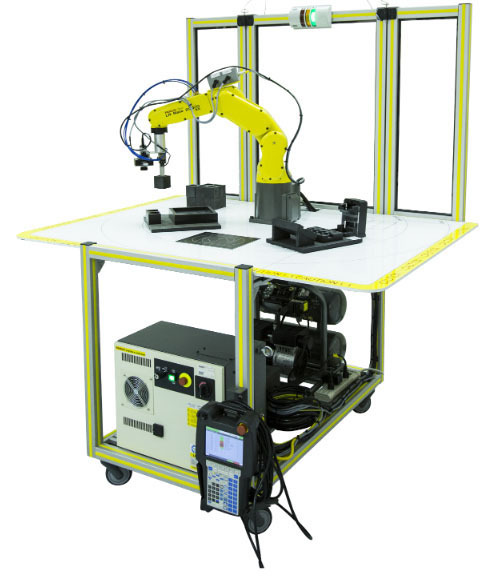 FANUC Robotics Industry Certified Education Robot Training Perogram offers a Project Based Learning "Battery Package" designed to give students a practical application for learning machine vision concepts using FANUC iRVision Error Proofing and FANUC iRVision 2D Guidance. 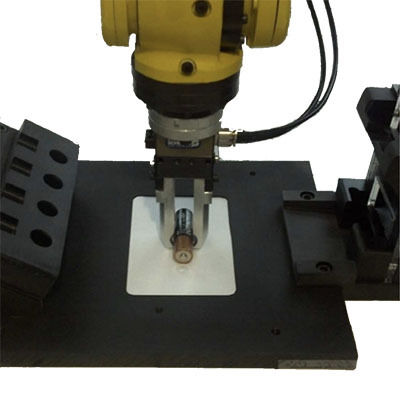 FANUC Robotics Industry Certified Education Robot Training Program offers a Project Based Learning "Pill Sorting Package" designed to give students a practical application for learnign machine vision concepts using FANUC iRVIsion Error Proofing and FANUC iRVision 2D guidance.